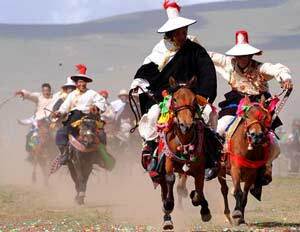 Nagqu Horse Racing Festival is the most important folk festival and it happens in Nagqu prefecture, the largest prefecture in Tibet. The event falls on early August because August is a golden season for grasses’ growth. People gather together for the annual horse race festival in Nagqu town and construct a tent city. Dressing themselves and their finest horse, thousands of herdsmen participate in the thrilling horse race, archery and horsemanship contest. Other folk activities and commodity fairs are also held. 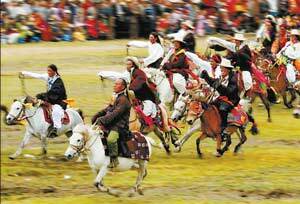 There are different kinds of horse racing festivals held in Tibet because Tibetan people are nomads and they worship strength and bravery very much. Horse is their favorite animal and they are deeply attached to it. 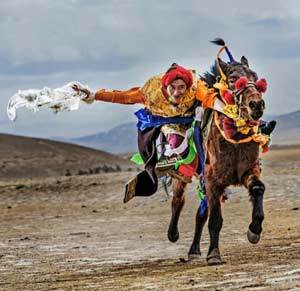 Gyantse Horse Racing Festival is also popular throughout Tibet. This usually falls in June. Horse race, archery contest, and other games are performed to entertain people. Religious activities also are part of the event.